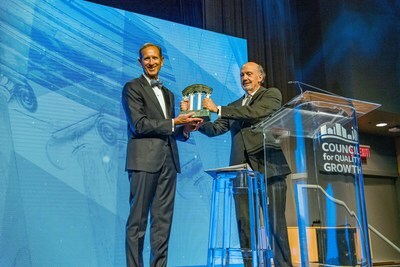 ATLANTA, Oct. 5, 2018 /PRNewswire/ -- Paul Bowers, Georgia Power's chairman, president and CEO, was honored last night for his leadership by The Council for Quality Growth, with its 29th annual Four Pillar Tribute. The Four Pillar Award is a prestigious leadership award given to an outstanding Georgian who has served his or her community, region and state. The honor celebrates the recipient's philanthropic efforts, as well as significant contributions to economic development and the region's quality of life. The pillars of the award represent the principles on which the Council was founded: Quality, Responsibility, Vision and Integrity. "It is an honor to be given the Four Pillar Award, but this recognition is truly deserved by our great team at Georgia Power," said Bowers. "Every year, our company, employees and retirees renew their commitment to building a better tomorrow for the communities we serve, and I am proud to be a part of that." As the Council's 29th honoree, Bowers chose "Purpose" as the theme for this year's ceremony, fitting to both Georgia Power's and his own values. It is a personal conviction that he believes his life's purpose is to leave a legacy of service to his fellow citizens, coworkers, and family. 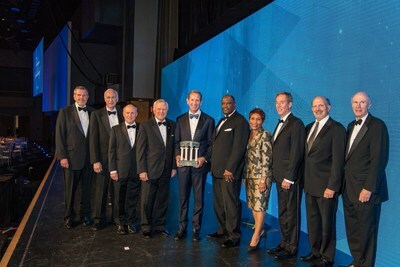 A dynamic group of leaders delivered personal remarks on the four pillars of leadership and success that Bowers exemplifies: Juanita Baranco, co-owner of Baranco Automotive who serves on the board of Southern Company, former Home Depot CEO Frank Blake, CEO and Chairman of Chick-fil-A Dan Cathy, Governor Nathan Deal and Pastor Andy Stanley. "A lot of people think integrity is about kindness. It has taken on many different meanings and connotations over the years, but to me, integrity is the strength to get things done. Can your integrity carry the burden and weight of daily life," said Gov. Deal during his tribute remarks. "Paul Bowers is the kind of man who has the integrity – the strength – to get things done." "It was so humbling to hear the warm remarks shared by such esteemed leaders in their own rights, but more importantly to stand in front of leaders from across our state and urge them to lead with their hearts, because that is truly what our communities need," said Bowers. Bowers serves on many boards benefitting many communities, including the boards of Children's Healthcare of Atlanta, Metro Atlanta Chamber of Commerce, Georgia Chamber of Commerce, the Georgia Ports Authority and more. He is also a curator for the Georgia Historical Society, and a past member of the Federal Reserve Bank of Atlanta's Energy Policy Council and the Board of Regents of the University System of Georgia. The event marked the 29th year that the Council for Quality Growth, a not-for-profit trade association that promotes balanced and responsible growth, has paid tribute to such leaders. Past leaders honored with the Four Pillars Award include Arthur M. Blank, Dan T. Cathy, former Atlanta Mayor Shirley Franklin, U.S. Senator Johnny Isakson, and last year's recipient, Governor Nathan Deal.